And though she be but little, she is fierce. 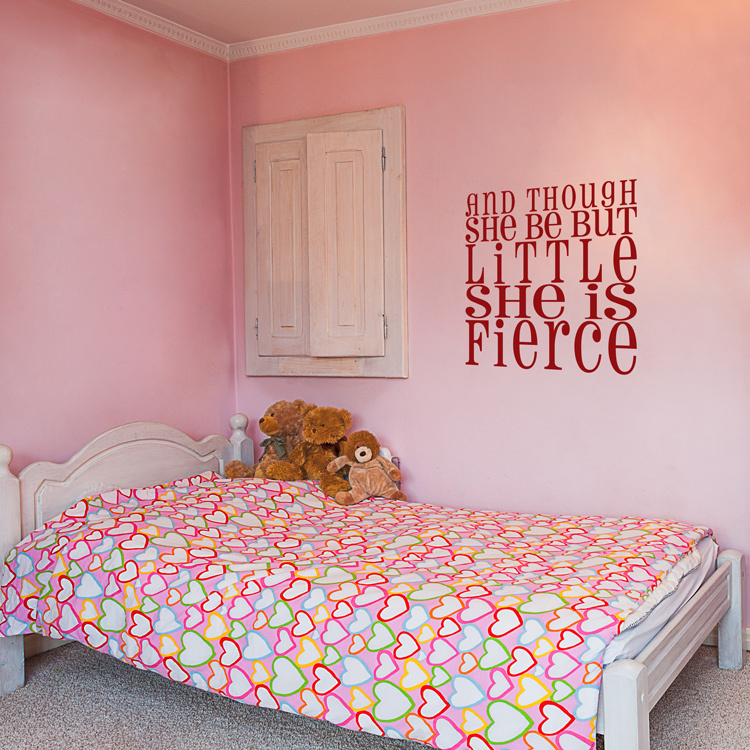 Empower your girls to be bold and brave, regardless of their size! Our wall decals are ideal for bedrooms, offices, living rooms, entryways, classrooms, even your car, bathtub or glass shower doors! This decal comes in one piece ready to apply, but can be cut apart if you would like to separate the lines of text to create your own look. Thanks for making a quality product. Installation instructions were easy to follow, and the results were great. Anyone wanting this type of wall decor should not have any hesitation about ordering your products. The value is definitely in your "decals". I am so pleased with every interaction I have had with Dali Decals. I had multiple back and forth conversations over the span of weeks. I always received prompt responses or answers to my questions. When I got my custom decal it was even better than I expected! Definitely will be back again! !